Before requesting access to data, a researcher needs to register by sending a data access request. To create a data access request, users have to fill out the application form and submit it once it is completed. The validate button can be used to check that the form contains the required information. Before submitting he request, the form can be edited and saved (for future edits) as needed. After the request is submitted, the form is frozen and can no longer be edited unless the request is reopened. After the request is submitted, a data access officer will review it in order to approve or reject it. The data access officer can also reopen (or conditionally approve) the request if he considers that modifications are needed. 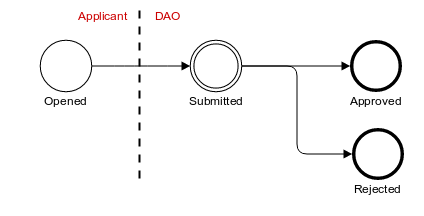 This workflow, as well as email notifications that can be sent on request status changes, can be configured by the administrator, e.g. to omit the review step or make the approve/reject steps final. The request is submitted to the application officer and is not editable by the applicant. 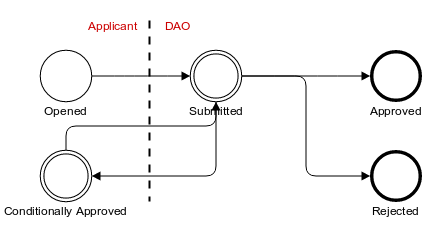 The application officer can (conditionally) approve or reject it or, if configured, go to an intermediate under review status. The request is being reviewed by the application officer. He can reopen, conditionally approve (if this state is activated), approve or reject the request. The request has been approved. If configured, the request can go back to the submitted or reviewed status. The request has been rejected. If configured, the request can go back to the submitted or reviewed status. The request was submitted, has been reviewed and some adjustments are required before a final approval. The applicant can edit its request and will re-submit it. The application form is configured by the administrator, who can also define the PDF template used to create a printable copy of the form (available by clicking on the Download button). Researchers can submit amendments to request changes (e.g. additional data, new research collaborators) to a pre-approved data access request. To enhance the collaboration between users and data access officer, each member can add a comment to a data access request. Mica can be configured to send email notifications when a comment is added or updated. Administrators, data access officers and users with proper permissions (see data access request permissions) can add private comments while processing a data access request or an amendment. A list of all status changes of a data access request and its amendments. In addition, administrators and data access officers can log actions that they have taken while processing a request or an amendment. These actions are either pre-defined or free text. Only users or groups with proper permissions (see data access request permissions) can view action logs.